Will IBM be your AI and machine learning platform? Here’s how IBM got its start in artificial intelligence, and what it brings to the table for your business or organization. IBM CEO Ginni Rometty and IBM Watson Group Senior VP Mike Rhodin. Of all the tech giants throwing their weight behind artificial intelligence (AI) and machine learning, few receive the kind of attention garnered by IBM. After its seminal Jeopardy win in 2011, IBM Watson became synonymous with technologies such as cognitive computing and AI. Upon losing to Watson, former Jeopardy champion Ken Jennings famously wrote „I, for one, welcome our new computer overlords“ under one of his responses. All of a sudden, Watson was a household name, igniting conversations about what could be accomplished with AI. While Watson is a major part of IBM’s approach to AI solutions, it’s only a piece of the puzzle. Here’s a deeper look at the bigger picture, so businesses can determine if IBM is the right AI vendor for their needs. IBM Research, the company’s research division, dates back to 1945, when it opened the Watson Scientific Computing Laboratory at Columbia University. IBM’s work in AI began in the 1950s, according to its website. Around that time, an IBM employee named Arthur Samuel wrote a self-learning program for playing checkers, and would later be recognized as a pioneer in AI and machine learning. In the 1970s, IBM built its first robot, and advanced its work in the field in the 1980s with the IBM RS 1. In the 1990s, IBM Researcher Gerry Tesauro used reinforcement learning (RL) to create a self-learning game of backgammon. Then, in 1997, IBM’s Deep Blue computer famously beat World Chess Champion Garry Kasparov at chess. The company’s development of actual AI products began more recently. Mike Gualtieri, of Forrester Research, said that IBM’s journey toward AI solutions began in 2009, when it acquired two companies: ILOG and SPSS. ILOG is a business rules engine, Gualtieri said, which used to be called an expert system, while SPSS provides advanced analytics. Both of these purchases helped jumpstart IBM’s work on AI solutions for businesses. Today, IBM’s AI initiatives are centered around the Watson platform. IBM has Watson solutions for analytics and machine learning, data search and discovery, and conversation tools like chat bots. Currently, Banavar said, there are „thousands“ of engineers working on the Watson platform. On a high level, the team is split into two very distinctive camps. One on end of the spectrum is a group working on „very concrete, commercial development and deployment,“ which happens usually on a weekly, monthly, or quarterly basis. „Then, at the other end of the spectrum, we have teams of people that are working on advanced new technologies — some of which are being invented — all the way up to mathematicians who are developing the underlying techniques for them,“ Banavar said. After Watson won Jeopardy, Banavar said the team at IBM was focused on building custom systems for specific clients or industry niches. However, they recently had to make a conscious strategic decision to move away from that model to focus on APIs. Banavar said that IBM realized it wouldn’t be possible to build out all of the applications they wanted to with their existing strategy. So, they turned some of their capabilities into a platform with open APIs, „in order to attract and nurture a larger ecosystem of developers that can build many applications that IBM cannot build by ourselves,“ Banavar said. Those APIs are being put to use in areas like retail, finance, law, and even fantasy football. But healthcare is one of the primary focuses for Watson solutions. To understand whether or not IBM would be a good fit for your organization, you must weigh your company’s needs against IBM’s strengths. On the technical side of things, Banavar said, these strengths start with Watson’s language capabilities. When it comes to business, IBM’s AI strength comes from three key elements: IBM Research, its acquisition prowess, and its consultants. IBM Research may not always produce a breakthrough, but it does give the company a distinctive edge, said Gualtieri. „The advantage of that is that the largest companies in the world — who IBM wants to sell to — want that edge,“ he added. The ability to acquire the right companies to broaden its portfolio of offerings is a key differentiator for IBM. Banavar noted that the company has also been leveraging open-source libraries and toolkits to make use of new techniques in neural networking, word embedding, and more. One of the biggest challenges facing IBM is managing the expectations that come from terms like cognitive computing and AI. This is further compounded by the public-facing nature of Watson, especially in the wake of its Jeopardy win, and confusion around the capabilities of AI as well. „Everyone thinks that we’re on the verge of Star Trek, like next week,“ Gualtieri said. So, IBM must have a grand and transformative vision about the future of AI, but they also have to keep the expectations in check so customers don’t regret moving forward, Gualtieri noted. On the question of safety and ethics, many would share Gualtieri’s view that the technology „is not even close to getting to the point where ethical issues are really a serious concern.“ However, Banavar said that ethical challenges are still something the IBM team must consider. The first crucial issue that must be addressed, Banavar said, is the idea of explainability. If a doctor or financial advisor uses Watson to make a decision, for example, they must be able to understand why Watson chose a particular solution or set of options. The other ethical consideration is bias. With machine learning systems, the models are built with training data — but the data has to faithfully represent what you’re trying to model, or it could be biased, Banavar said. Because of that, selecting the proper training data set is an ethical decision of the utmost importance. This is made even more important by how broad a potential impact Banavar sees for AI technologies. „At the end of the day, I do think that cognitive computing is necessary for us to solve the world’s big problems,“ Banavar said. Dieser Eintrag wurde veröffentlicht in Artificial Intelligence und getaggt mit IBM am 2. Dezember 2016 von innovation. This apparently represents IBM’s artificial neurons, though I’m not entirely convinced. I guess the red/yellow/orange/blue bits are the phase-change material? 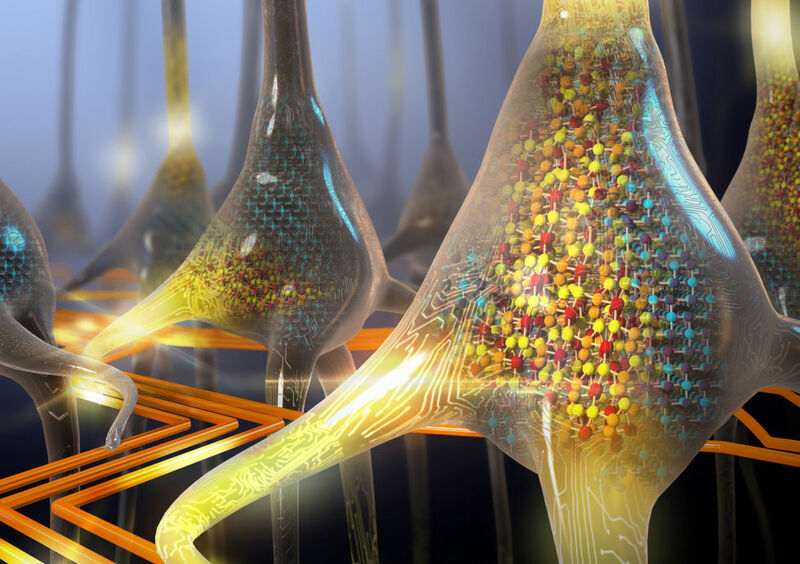 IBM Research in Zurich has created the world’s first artificial nanoscale stochastic phase-change neurons. IBM has already created a population of 500 of these artificial neurons and used them to process a signal in a brain-like (neuromorphic) way. This breakthrough is particularly notable because the phase-change neurons are fashioned out of well-understood materials that can scale down to a few nanometres, and because they are capable of firing at high speed but with low energy requirements. Also important is the neurons‘ stochasticity—that is, their ability to always produce slightly different, random results, like biological neurons. Enough fluff—let’s talk about how these phase-change neurons are actually constructed. At this point, it might help if you look at the first diagram in the gallery. Like a biological neuron, IBM’s artificial neuron has inputs (dendrites), a neuronal membrane (lipid bilayer) around the spike generator (soma, nucleus), and an output (axon). There’s also a back-propagation link from the spike generator back to the inputs, to reinforce the strength of some input spikes. The key difference is in the neuronal membrane. In a real neuron, this would be a lipid bilayer, which essentially acts as both a resistor and a capacitor: it resists conductance, but eventually, with enough electricity along the input dendrite, it builds up enough potential that its own spike of electricity is produced—which then flows along the axons to other neurons—and so on and on. In IBM’s neuron, the membrane is replaced with a small square of germanium-antimony-tellurium (GeSbTe or GST). GST, which happens to be the main active ingredient in rewritable optical discs, is a phase-change material. This means it can happily exist in two different phases (in this case crystalline and amorphous), and easily switch between the two, usually by applying heat (by way of laser or electricity). A phase-change material has very different physical properties depending on which phase it’s in: in the case of GST, its amorphous phase is an electrical insulator, while the crystalline phase conducts. With the artificial neurons, the square of GST begins life in its amorphous phase. Then, as spikes arrive from the inputs, the GST slowly begins to crystallise. Eventually, the GST crystallises enough that it becomes conductive—and voilà, electricity flows across the membrane and creates a spike. After an arbitrary refractory period (a resting period where something isn’t responsive to stimuli), the GST is reset back to its amorphous phase and the process begins again. „Stochastic“ refers to a system where there is an amount of randomness in the results. Biological neurons are stochastic due to a range of different noises (ionic conductance, thermal, background). IBM says that its artificial neurons exhibit similar stochastic behaviour because the amorphous state of each GST cell is always slightly different after each reset, which in turn causes the crystallisation process to be different. Thus, the engineers never quite know exactly when each artificial neuron will fire. A photo of a wafer full of phase-change devices (the silver squares). The probe needles are required to make the actual thing work: this is a prototype chip without the usual traces/pins that would connect it to a circuit board. Phew, you made it. Now what? Second, these phase-change neurons are the closest we’ve come to creating artificial devices that behave like biological neurons, perhaps leading us towards efficient, massively parallel computer designs that apply neuromorphic approaches to decision-making and processing sensory information. IBM says that their new work is complementary to research being carried out into memristor-based synapses, too. So far, IBM has built 10×10 crossbar arrays of neurons, connected five of those arrays together to create neuronal populations of up to 500 neurons, and then processed broadband signals in a novel, brain-like way. (In technical terms, the neurons showed the same „population coding“ that emerges in biological neurons, and the signal processing circumvented the Nyquist-Shannon sampling theorem). There’s no reason to stop there, though. Now it’s time put thousands of these phase-change neurons onto a single chip—and then the difficult bit: writing some software that actually makes use of the chip’s neuromorphosity. Nature Nanotechnology, 2016. DOI: 10.1038/nnano.2016.70 (About DOIs). Dieser Eintrag wurde veröffentlicht in Innovation und getaggt mit Artificial Neurons, IBM am 5. August 2016 von innovation. here’s a big shift happening in how enterprises buy and deploy software. In the last few years, open technology — software that is open to change and free to adopt — has gone from the exception to the rule for most enterprises. We’ve seen the IT stack redrawn atop powerful open-source projects, with developers opting for an “open-first” approach to building solutions. More than 78 percent of enterprises run on open source and fewer than 3 percent indicate they don’t rely on open software in any way, according to a recent market survey by Black Duck Software. Openness is a near truism in the Valley, but today projects like Hadoop, Cassandra, Docker and Mule are infiltrating even the most conservative and dogmatic organizations. As such, startups like Cloudera, DataStax and MuleSoft are generating hundreds of millions of dollars in revenue each year from real enterprise customers by selling proprietary, value-added products around their open projects. This is a new wave in software — one that’s not only displacing incumbent markets, but creating entirely new ones. We call these Open Adoption Software (OAS) companies, and we believe they’re primed to build meaningful businesses — and drive large economic outcomes. We’re witnessing a big shift in how software is consumed. OAS companies are constructed differently. They go through three phases of company building: Project, Product and Profit. Companies built atop this “3Ps” model need to look largely the same and be held to similar financial standards as traditional enterprise software businesses by the time they make it into the “Profit” phase. We discussed this a few weeks back in a panel conversation with startups and financial analysts — a timely conversation, as some of these companies reach the scale to potentially IPO. This feels an awful lot like 2003, just before the first SaaS companies started going public. Open software has already rooted itself deep within today’s Fortune 500, with many contributing back to the projects they adopt. We’re not just talking stalwarts like Google and Facebook; big companies like Walmart, GE, Merck, Goldman Sachs — even the federal government — are fleeing the safety of established tech vendors for the promises of greater control and capability with open software. These are real customers with real budgets demanding a new model of software. The Need for Speed and Control: The demand for innovation and rapid delivery means enterprises need agility from the software they adopt. Nothing is worse than waiting for a vendor to update a library when you’re trying to stick to your release schedule. Open platforms allow companies to move faster and integrate at a deeper level without fear of lock-in by removing the dependency on proprietary vendors. Enterprises are no longer beholden to a vendor’s product roadmap — they can innovate to their own requirements at any time. Everything is Web Scale: Enterprises are delivering solutions to a global, ever-connected base of users. Consider banks that support tens of millions of end users logging into their banking apps and hundreds of thousands of employees worldwide. Traditional, proprietary vendors are unable to deal with this onslaught of data and user scale. Fortunate for them, many early web 2.0 leaders (Google, Facebook, Linkedin, Yahoo) dealt with these problems and more, contributing much of their learnings to the open community. Developer Power and Network Effects: CIOs are empowering frontline developers to download and adopt the projects they need to drive innovation. Developers are looking to community-led technologies where they adopt, deploy and meaningfully participate. OAS extends beyond Moore’s Law by also benefitting from something akin to Metcalfe’s Law: its energy and rate of innovation grows exponentially with the developer networks around it. Open software can absorb learnings and requirements far faster than a proprietary vendor, while simultaneously hardening security and stability. Open software is in many respects, much safer. Hadoop and Docker are constantly stretched, pushed, molded and smoothed by their developer communities — they’re far more mature than their age would suggest. All of this is to say: We’re witnessing a big shift in how software is consumed. OAS is openly adopted and openly developed, and is quickly becoming a dominant model for how enterprises build and deliver IT. While most OAS companies have at least some amount of freely available or open-source components, open source and OAS should not be conflated. Open source describes a software development methodology, whereas OAS pertains more to a go-to-market and company-building philosophy. OAS is not about cheaper alternatives to proprietary on-premise software. It is about creating new markets more so than displacing incumbents. It’s innovative, it’s developer-driven and it’s the next wave of software adoption. With each successive wave of technology — from mainframe to client-server to ‘X’aaS (IaaS, SaaS, etc.) to OAS — software has gotten progressively easier to adopt. Therefore, adoption has happened faster and has reached a broader audience than the wave before it. Each wave is driven by the democratization of some facet of technology. In the shift from mainframe to client-server, computers became accessible. In the shift to ‘X’aaS, hosting and WAN connectivity became accessible. Now, with the shift to OAS, developer community innovation has become accessible. OAS not only represents a new way to provide innovative functionality, but is a delivery model innovation for developers. Through it all, the customer desire for bigger, faster and cheaper offerings remains constant. The technological innovations that each wave brings facilitate change in how software is packaged and delivered so that customers can gain some form of efficiency or cost savings. Being openly adopted is not a panacea. With all of these shifts, industry pundits predicted that the new wave will commoditize existing categories. While some layers of the stack do get cheaper, consumption on the layer above consequently expands dramatically as more applications are developed and new use cases emerge. This new usage outpaces any commoditization. Thus, the value of the market opportunity expands rather than contracts. Salesforce and Amazon Web Services (AWS) exemplify this. Literally thousands of new businesses exist as a result of these platforms than ever could have in the past. While OAS companies drive adoption much faster than their fully proprietary counterparts, being openly adopted is not a panacea. Particularly as public cloud vendors begin hosting open-source projects as a service, it’s tremendously important that these companies thoughtfully decide which parts of the product will be open and which parts won’t. There is definitely a unique failure mode in which OAS companies go too open and fail to monetize sufficiently. While we certainly believe in OAS, not all open projects are the basis for OAS companies, and not all of these companies are going to be publicly traded — some will be niches, some will struggle, some will be M&A opportunities. It’s hard to predict the winners out of the gate. While OAS companies will likely have the same success rate as traditional software companies, there is reason to believe that the winners will be bigger than their predecessors. Dieser Eintrag wurde veröffentlicht in Innovation und getaggt mit acquia, Adobe, Autonomy, cloudera, couchbase, elasticsearch, IBM, mongodb, mulesoft, OAS, Open Adoption Software, oracle, salesforce, servicenow, Silicon Graphics, tenable, unity, vmware am 20. Juni 2016 von innovation.